Okay so this may not be seen as an anime because it's created by RoosterTeeth, but it's on Crunchyroll. Not a strong argument, but I'm reviewing it anyway but won't (for balance) list it in the anime category. I don't know what made me want to watch RWBY. and I started it not thinking it much about it. I heard of the name and kept calling it R W B Y, but it's pronounced ruby. You find out about this like a few episodes in and makes a lot of sense when you find out the name's origin. Anyway, going into this without thinking of what to expect was a good idea (I do this with quite a lot of anime), and I really enjoyed it. 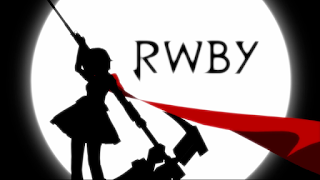 RWBY follows Ruby Rose, a scythe/gun-wielding girl with a cape who is recruited into a school that trains people to become Hunters or Huntresses. A bit vague, but I shall explain. We're introduced to the world of Remnant and its various inhabitants, one of which is called the Grimm. These are monsters who are created from people's fear, depression and what not, and it's the job of the Hunters and Huntresses to keep them at bay and maintain the peace in the world. One of the schools which trains people to become Hunters or Huntresses is Beacon Academy, and it's the one Ruby enrols in after being seen fighting by the Headmaster. There she (and we) meet her sister Yang, Weiss and Blake who join Ruby and everyone else in the journey to become Hunters or Huntresses and protect Remnant. But it's not a walk in the park, as there are other evils that lurk in the shadows which they must face. From the moment I started RWBY, it reminded me of a video game due to its graphics. After watching a bite sized episode (ranging between 4 and 22 minutes so you can easily binge watch the whole thing) I felt like I should be playing as Ruby or one of the other three, running around doing missions and talking to characters as you do in a RPG, before reaching the next cutscene. And then there are the action scenes. They are absolutely amazing with an epic soundtrack playing in the background, and again make you feel like you should be in on the experience, levelling up your characters as the story progresses and unlocking new skills and moves which will help them through the more difficult fights that lie ahead. And if that doesn't want to make you watch this, you're missing out on some epic stuff. As Ruby and co progress through Beacon, things start to unravel and we find out that it's not just about fighting Grimm. I did mention that other evils lie in wait for our heroines, but not just for those four. Other characters are just as important and have their own unique personalities, fighting styles and backgrounds, and you can't help but love them just as much as Ruby, Weiss, Blake and Yang. They add more personality and depth to the story, and you can't help but smile when you see them with Ruby and co. But that's not all, as we're also given bite size history lessons about the world of Remnant. Given that there are currently 4 seasons of RWBY, we should learn more about their world and increasing character count no? These episodes come in at random times from Season 3 onwards, and give us breathers from all the fast-paced action and story. They definitely put some things into place, such as the origin of Dust, the magic used power things and defeat Grimm. At Season 4, the story is still going. Things have taken a dark turn since the end of Season 3 and the action has died down a bit, but it fails to disappoint despite this. For now it's more story driven and slower to progress than previous seasons, but hopefully we get to see some good action scenes in the upcoming episodes. And with the awesome soundtrack, you can't help but binge watch the series just to hear the opening songs (a couple of which I really like) as well as find out how our heroines' journey progress. By the time you step back into reality, you'll have reached the most recent episode. RWBY is amazing and makes you feel like you should also be playing it. There is a video game out (no idea what platform or the release date) so I guess that settles the desire to want to play the series, but you should definitely watch the series. Well written and directed, great characters, story, action and soundtrack and can easily be binge watched; what more can you ask for?